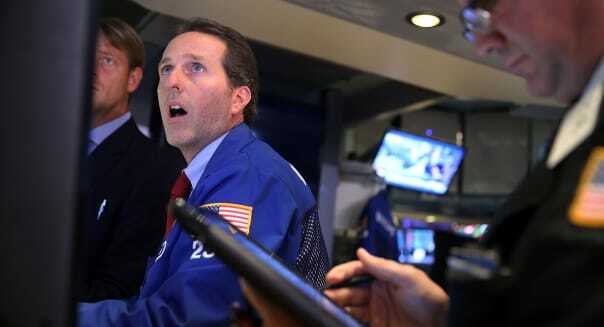 Getty ImagesThe recent decline in U.S. equity prices has created some undervalued equities on Wall Street. The past few weeks have seen huge jumps in the level of market volatility as investors have seesawed between bullishness and bearishness on a near-daily basis. The Chicago Board Options Exchange volatility index (^VIX), a measure of market volatility, hit a 52-week high on Aug. 24. Many large-capitalization U.S. stocks find themselves trading 5 percent to 10 percent lower than where they were just a few weeks ago. Although their fundamentals have not changed, many of these stocks now find themselves "on sale" and may represent a buying opportunity for patient, long-term investors. We'll use the principles of value investing to search for stocks that now appear undervalued as a result of the recent decline in U.S. equity prices. Find companies with a long-term track record of growing revenue and earnings per share. Rather than being concerned with the last quarter's earnings, value investors wish to invest in companies that have displayed a long-term (10 years or more) history of growing their businesses. Favor companies with low debt. Debt becomes a drag on a company's earnings – especially in the environment of increasing interest rates. Prefer companies that pay a dividend and ideally have a strong track record of increasing their dividend payouts over time. Find companies with consistent numbers of shares outstanding. Each time a company issues new shares, it dilutes the equity of existing shareholders. We wish to avoid companies that are constantly issuing new shares. Most importantly, we wish to find companies which trade below their fair value. Fair value is a concept with many definitions. In his book "One Up on Wall Street," famed value investor Peter Lynch says that a company was fairly valued when its price-to-earnings ratio equaled its historic EPS growth rate. This definition makes intuitive sense, as we should be willing to pay more for a stock that is enjoying a higher rate of earnings growth. Although the above are by no means an all-inclusive shopping list for value investors, they do form a useful starting point to screen for value stocks. Priceline Group (PCLN) is an online flight, hotel and car booking service operating under the priceline.com, booking.com, OpenTable and Kayak brands. It has been a high-flying stock for years, but has seen its share price cut by approximately 5 percent in the past month. The stock has a long-term track record of consistently growing its revenue and earnings and has a trailing P/E ratio of 29. On Aug. 5, the company reported second-quarter results that beat analyst expectations for both revenue and earnings. In spite of this, investors have punished the stock, which is trading down by 3 percent year over year. Edwards Lifesciences (EW) is a medical equipment company specializing in artificial heart valves. The company has a market capitalization of just more than $3 billion and has a long track record of growing revenue and earnings. Edwards now has a 10-year EPS growth rate of 19 percent. Many biotech stocks enjoyed high valuations prior to the recent period of market volatility and as a result have seen their prices slashed as investors flee risk for safer investments. Edwards is trading down 11.5 percent since achieving a 52-week high on July 29. LKQ Corp. (LKQ) is a Fortune 500 company specializing in replacement components and systems for cars and light trucks. LKQ fits many of the classic value-investing principles, with a consistent history of revenue and earnings growth, a low debt and trading below its fair value. After losing approximately 10 percent of its value in the volatile days of late August, LKQ has started to rally back and has made up about half of this amount. The investment ideas presented here are for information only. They don't constitute advice or a recommendation by Recognia Inc. in respect of the investment in financial instruments. Investors should conduct further research before investing. Peter Ashton of Recognia is a blogger for The Smarter Investor. You can follow him and Recognia on Twitter at @Recognia_Peter and @Recognia.